British guitarist Chris Standring is well acquainted with the habits of the music industry. To stay in the public interest of music fans, it is essential to draw their attention with regular publications. This experience internalized Chris pleased the community with his albums Velvet (1998), Hip Sway (2000), Groovalicious (2003), Soul Express (2006), Love and Paragraphs (2008), Blue Bolero (2010), and Send Me Some Snow (2011), a collaboration with singer Kathrin Shorr. Chris invited befriended musicians like Andre Berry, Jimmy Earl, Dan Lutz, Larry Steen (bass), Rodney Lee (Fender Rhodes), David Karasony, Oscar Seaton (drums), Rick Braun (flugelhorn, trumpet), Mitchel Forman (piano), Dino Soldo (clarinet, EWI, saxophone). Strings are played by Nikki Garcia, Barbra Porter, Cameron Stone and Tom Tally. Pandora's Box is a Greek artifact, which contained all the evils of the world. With a twinkling eye, Chris has chosen a title that is more like the opposite of what he lets us come good. Mellow but still funky creeps his guitar sound into our brain. When the leaves turn slowly yellow and moves in the autumn, it is Almost September. With emotional elegance Standring paints in the colors of fall He finds himself in good company with trumpet player Rick Braun and pianist Mitch Forman. 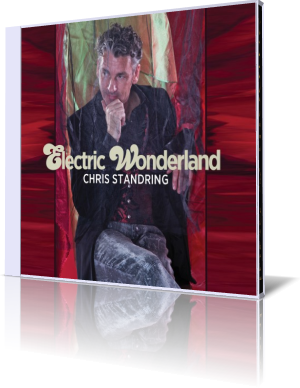 On All That Glitters Chris Standring awakes all senses expanding the melody to a great sound tapestry in the style of Pat Metheny or Ken Navarro. Oliver's Twist builds on the current fashion trend of European lounge sound. Contemporary entertainment with a hip shuffle beat. A remixed and extended version is available as downloadable bonus track for all visitors of Chris' website. On Wishful Thinking Chris uses a guitar effect called Talk Box. This is a small unit, which can modify the guitar sound with a vocal input. Famous example of a Talk Box song is Tell Me Something Good by Rufus and Chaka Khan. Heart Of The Matter is the second lyrical approach on this album perfectly realized with great support of Mitch Forman on piano, Larry Steen on acoustic bass and David Karasony on drums. For me the most appealing side of this brilliant guitarist. With expansive chords Chris wanders on Escapade through the soundscape of modern music. Merry Go Round is the counterpart to the previous tune. Starting as a homespun waltz the song surprisingly transfers to a swinging jazz piece. On Castle In The Sky Chris accompanies his guitar with a guitarlele. As the name suggests, the guitarlele is a cross between a classical guitar and a ukulele. The guitar walks on the wild side of life, while the guitarlele delivers a pinch of happiness. Nightingale's Bridge closes the album with Standrings' very own contemplation. Electric Wonderland doesn't squint at the charts. It's just the music, where this guitar master stands today. A new peak of guitar reference.